After Sarajevo, we drove to Mostar along an alpine road, except that mosques, with their elegant, stone-needle minarets, stood in place of churches. The town took its name from the bridge which spans the turquoise waters of the Neretva River. ‘Most’ means bridge, and ‘star’, old. Rebecca West was there in 1936 and wrote in Black Lamb and Grey Falcon, ‘It is one of the most beautiful bridges in the world. A slender arch lies between two round towers, its parapet bent in a shallow angle in the centre. To look at it is good; to stand on it is as good. Over the grey-green river swoop hundreds of swallows, and on the banks, mosques and white houses stand among glades of trees and bushes.’ Constructed in the 16th century by order of Suleiman the Magnificent and designed by his architect, Hajrudin, the stones were held together with horsehair and manure. When the scaffolding was removed, the architect had disappeared. 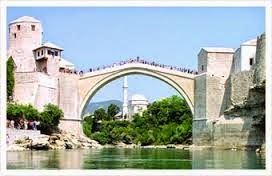 The Sultan had threatened to cut off Hajrudin’s head if his bridge fell into the river. For many centuries and despite earthquakes and wars, it didn’t. We spent a scorching afternoon walking through the narrow streets of the Old Town, trying to keep in the shade. After drinking at a riverside café, we walked onto the bridge and it was pleasant to stand at its centre, as Rebecca West had done, and feel the breeze from the mountains. The tourist office told us there was a campsite west of the town on the road to the Adriatic coast. We couldn’t find it and, as it was getting dark, we drove off the highway down to the river. In the middle of this wilderness we met a family from Tuzla. They had pitched an old canvas tent and beside it was a chicken coop with five scrawny hens. The father told us that they holidayed at this spot every year. I asked how long they had been there and he looked at the hens. ‘We came with ten,’ he said, ‘and eat one a day.’ ‘Are there wild animals in the woods?’ I asked. ‘Yes,’ he said, 'but it’s the people you should watch out for.’ I thought it was an odd thing to say, but I would have good reason to remember his words. Eighteen years later I came back.